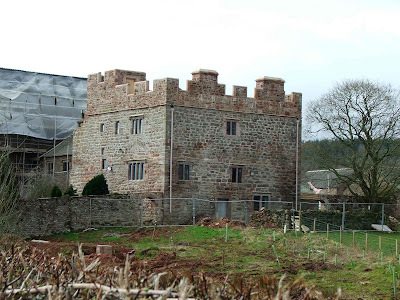 Waitby Castle is situated about a mile and a half West of Kirkby Stephen, and about a quarter of a mile East of the small village of Waitby. The remains are hidden, surprisingly, on the top of a hill, that overlooks the now disused railway embankments. From the roadside, the fort, for that is really what it is, cannot be seen, so maps and a little guesswork were essential in finding the remains. This involved crossing walls (carefully) and climbing the steep hillside. Once there, the remains are fairly obvious, and consist of the earthworks and buried remains of an enclosed Romano-British settlement. The fort is an oval shaped structure, surviving as banks and ditches, as well as the earthwork remains of up to 5 rectangular enclosures within the boundaries of the protective banks and ditches. These probably represent the earth footings of buildings. These remains are situated on the Eastern side of the castle. An inner stone bank separates these enclosures from the Western side of the castle, running North to South, and probably indicates the boundary of the settlement before a period of enlargement was undertaken. 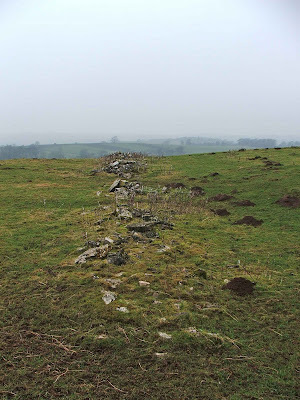 There are also a pair of dykes that run parallel with each other, probably representing a Northern entrance into the settlement. They run for around 80 metres, and are fairly well defined. Also running through the castle, is around 65 metres of a medieval dyke, which is represents the Northern end of a 2km, possibly defensive, dyke. The site was excavated in 1974, and it was surmised that the earliest period that the settlement was occupied, would have been around 2AD. 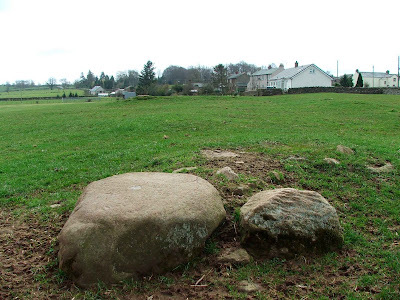 During this early period of occupation, the whole site would have been defended with a fence and ditch, and there is evidence that the yards between buildings were cobbled. Sometime in late 2AD or early 3AD, a new stone perimeter was erected, and it's likely that the original outer ditch was abandoned. An outer rampart replaced the ditch, and can still be seen to some degree. The castle has been slightly damaged in the past by some ploughing, but more recently by the use of tractors. Indeed there is a well defined pathway right through the middle of the earthworks. This site isn't really accessible, as it's off any public right of way. Aerial photo courtesy of Simon Ledingham. This photo really demonstrates the size and scope of this site. Not only does it show the fort itself, it also shows the dykes running through the earthworks, and the strip lynchets on the hill side. There has been a church on this site for hundreds of years, and the present, mostly 18th century church, still contains some 12th century masonry. The medieval church that stood here, was connected to a Gilbertine priory, the remains of which can still be seen to the rear of the church. The Gilbertines were the only English ecclesiastical order, and were founded in 1131. Up until the dissolution of the monasteries, there were 26 Gilbertine houses throughout England. 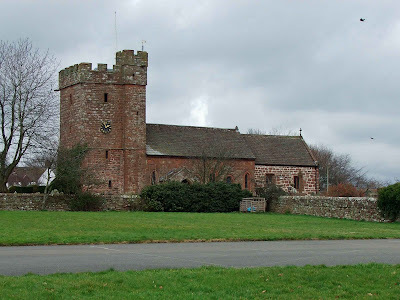 There was probably already a church here when this priory was built, and the manor of Ravenstonedale was granted to the Gilbertine order based at Watton in Yorkshire. There would most likely have been no more than 8 canons and a handful of lay men based here. The Gilbertines voluntarily gave up their lands and buildings to Henry VIII’s agents in 1538, and were pensioned off, with their lands and buildings passing into Royal ownership. 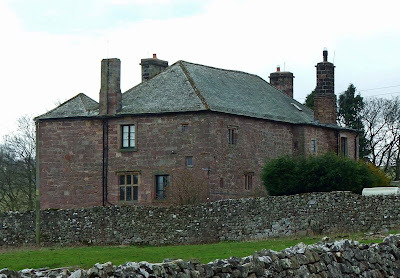 Henry VIII then granted the manor of Ravenstonedale to the Whartons, of Wharton Hall near Kirkby Stephen. It may have been the Whartons that fortified the buildings behind the church, using the ex-priory as an administrative centre for the newly granted manor. At some point the Whartons sold the manor and its lands to the Lowthers, the Earls of Lonsdale. The church of 1744 was, at times, used as a court house, where the steward and jury of the manor sat in judgment of local disputes and crimes. 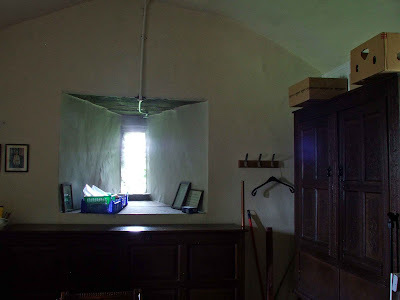 Prisoners were often kept in the vaulted chambers of the Wharton fortified buildings, the walls of which are over a metre thick in places. Above. This sandstone door jamb contains one side of a draw bar slot. The remains were excavated in 1928 and 1929, when the eastern parts of the priory were exposed, with later consolidation work being carried out by English Heritage. It's thought that the North wall of the refurbished church (1744) probably follows the course of the outer wall of the 'pele' tower, and is probably built over the footings of a spiral staircase that would have provided access from the ground floor of the tower to the first and second floors. Indeed, it's possible that the North wall of the pre 1744 church, was actually a component of the South wall of the tower, possibly further strengthening and protecting the building. The priory at Cartmel was built sometime in the late 12th and early 13th centuries. The gatehouse that lies to the west of the priory, was most likely built in the early 1330’s, and is the only ecclesiastical building apart from the priory itself that survives in the village. Whether this building can be regarded as a ‘fortification’ in its own right, is difficult to say. The fact that it is a gatehouse, in itself, means that a degree of fortification was present, i.e. 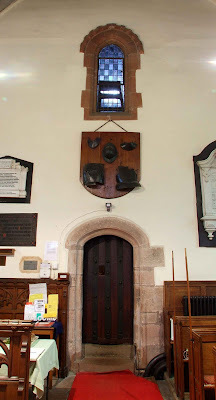 ; doors to prevent entry without the prior knowledge or permission of those occupying and controlling the Priory’s property and land, and tiny windows on the external walls, with none at ground or first floor levels. This is of course, different to a fortification that was built specifically to defend against raids or attacks. The building is an imposing remnant of the precincts of the priory, which would have enclosed a great area in which the present village is built. At the dissolution of the monasteries the priory was dissolved in 1537, and most of the ecclesiastical buildings were demolished, save of course for the priory, which was and still is the parish church, and the gatehouse, as this was then being used as a courtroom. The gatehouse housed a grammar school according to records from 1624, and has also been used as a prison. These days, it can be easily viewed from the road that runs directly through its massive arches. The small village of Tirril is about 6 miles West of Penrith, on the B5320. Sockbridge is a small area of the village off to the right. Above photo courtesy of Simon Ledingham. Simon's photo shows the layout of the site as it is now. It is thought that the fortified tower that once stood to the right hand side of the building in the foreground, with its attendant buildings and walled courtyard, would have been similar in form to Yanweth Hall near Penrith, although some of the buildings and the tower have long since been demolished, leaving only the gatehouse standing. The hall can be seen immediately to your right, unfortunately just below the brow of the hillside. The building at the forefront of the photo, is the gatehouse (now converted to a house) Built in the late 16th century, it has a small arched entrance (at the left hand gable). The gatehouse is entered through a stone stair case on this wall also. Some records state that there was once evidence for a moat surrounding the whole site...although the evidence has long since been ploughed away. The building in the background, with the black and white windows, is probably of the same period (late 16th century) but with 17th and 18th century additions. It's likely that this building contains masonry from a demolished 14th century pele tower...but to what extent this original tower still survives isn't known. 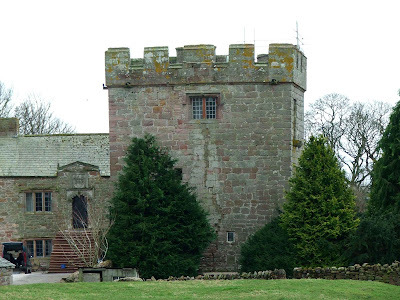 It's thought that the original pele tower was built in 1375, but was demolished or partly demolished in 1830, with most of the material 'liberated' taken to Lowther Park to build Buckham Lodge\the gatehouse. 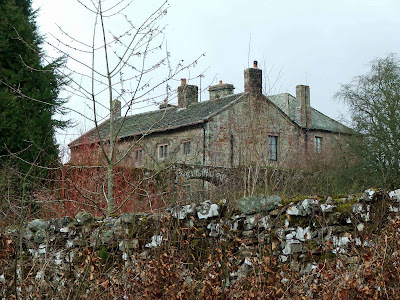 It is probable that the hall and the pele tower were built by the Lancaster family....who have connections with the Hartsop family of Hartsop Hall, a 15th century building with the remains of a pele tower nearby. 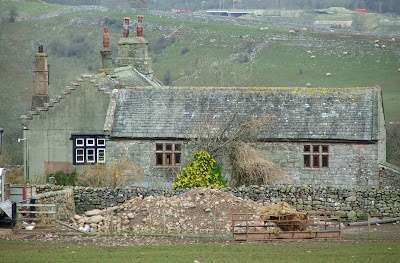 The hall and the gatehouse can be seen from the roadside, however the view is obscured by farm buildings and as they are below the brow of the hill, only a partial view is possible. 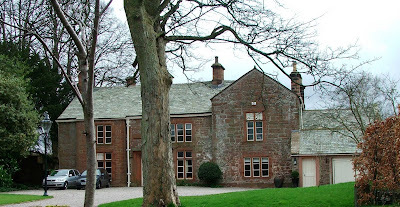 Johnby Hall sits about a mile and a half North of Greystoke, and just South of the tiny hamlet of Johnby. The hall sits on the left hand side of the road as you travel out of Greystoke, high up above the roadside. This is another one of those annoying sites, that is surrounded by high walls, bushes and trees. The view from the roadside is therefore a little limited, and there are only a few tight angles from which the hall can be photographed from. At the very least, Johnby Hall is a fortified house. Built in the late 14th century, with 15th, 16th, 17th, 18th and 19th century alterations and periods of re-building, it’s a formidable building, with a wide range of outbuildings of a similar age. The hall consists of a 14th century two storey ‘tower’ to which a small 15th century tower has been added….a narrow corridor joining the two buildings. During the 16th century, the two towers were further joined, with the outer walls being refaced. Unfortunately, these two towers are to the front of the property….facing away from the road and totally private. The two views shown here are of the rear of the hall, backing onto the road beneath it. It’s thought that the Johnby family may have built the original tower. The improvements conducted in the 1650’s were undertaken by Sir Edward Musgrave, . The hall was leased to the Williams family. During their tenure, a stable block and a coach house were built. The hall was then leased to the Hasell family in 1696, and then sold to the 10th Duke of Norfolk in 1783. Check out the Johnby Hall web site. Well….this was an annoying site to visit. Typically, the gardens that surround Hutton John are well tended and quite spectacular….however, from my point of view, and with a camera that lacks an x-ray lense (!) they are nothing but a barrier. The pele tower is situated at the bottom of a steep hill near to the small hamlet of Hutton, a hundred yards North of Dacre Beck, and south of Penruddock. According to plans of the building, the tower, with its thick walls and crenelated roof, can be seen to the left of the above photo...behind the foreground building. The walls of this portion of Hutton John, are shown as about twice as thick as the rest of the buildings around it. The pele tower (original structure) was built in the late 14th century, possibly around 1353, by the Hutton family. Through the mid 17th, and early 18th centuries, various alterations and additions were made, until, as with many towers in this area, the original structure was swallowed up in the grandness of the building. 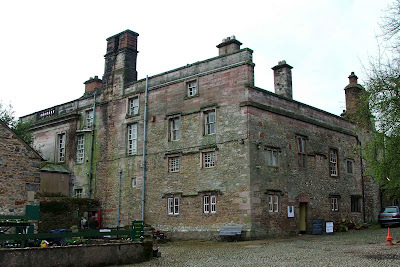 The later alterations were mostly carried out by the Huddleston family (of Millom castle fame) The hall came into the Huddleston family via the marriage of Marie Hutton in 1564 (god-daughter of Queen Mary) to Andrew Huddleston. The Huddlestons remained at the hall until the 1970’s. The tower has thick walls made of the familiar local red sandstone. One side of the courtyard possibly still has part of a curtain wall still standing….possibly dating from the 16th century. The tower, that part that can still be seen, still has a few loops visible on the external walls, whilst there are reputedly some loops visible inside the tower. 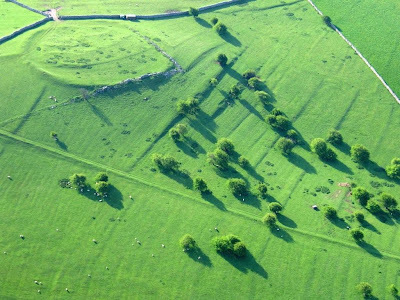 As with some other local towers (Blencow and Catterlen) the original site of the Hutton’s fortification, was a moated site still said to be visible some 150 metres to the East of the current hall. 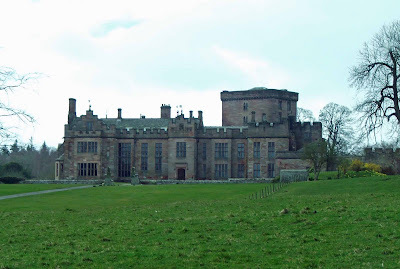 Greystoke is about 6 miles North West of Penrith, and about 2 miles North of the A66. There has been a castle here, or at least a fortified dwelling, since 1353. At this date, William, Lord of Greystoke was granted license to crenellate, in a license granted at Westminster on the 5th of October. This fortified tower, lay at the North end of the Greystoke site, and would have measured about 13 feet by 11 feet. Unfortunately for us, it was mostly demolished during alterations that took place in 1789. 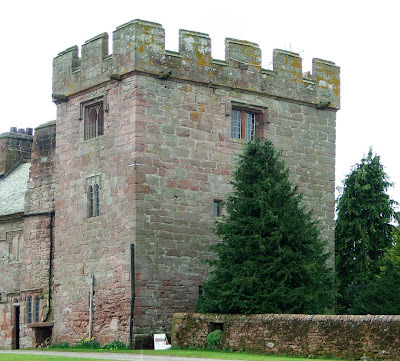 The castle passed to the Grimthorpe family, and then from around 1506 to 1569, the castle was held by the Dacre family. The Howard family then took ownership from 1595. The castle was captured by Parliamentarian forces in 1648, and was burnt and severely damaged. From this time, it lay in ruins, until some rebuilding was conducted in the 1670’s, by Henry Charles Howard. 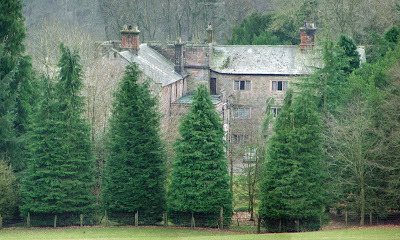 Buildings on the estate were rebuilt further from designs by Anthony Salvin, also famous for work he did on Muncaster Castle and other large country houses in Cumbria. A disastrous fire did much damage in 1868, with repairs conducted by Henry Howard. The grounds around the castle were commandeered by the British Army during WWII and used as a tank driving training range, with the castle and its buildings being used as a prisoner of war camp. During this period, the grounds and the buildings were comprehensively damaged. It took many years for repairs to be made, and the process of bringing the castle to its former glory seems to be ongoing today. About 200 yards to the North of the castle, the earthwork remains of what has been described as a civil war battery can still be seen. It’s likely that from here, Parliamentarian forces would have fired up on the castle during the brief siege in 1648. The castle and its grounds are private, and are only accessible by customers of the Corporate Hospitality, outdoor management training facilities and the nearby outdoor activity centre. Check out Simon Ledingham's aerial photo of the castle. This is a link to the castle's official web site. Dalemain sits at the side of the A592 on the West side of the River Eamont, and about 4 and a half miles South West of Penrith. There is some discrepancy over whether this building contains the remains of any fortification, and such are the extensive rebuilds and renovations that have taken place since the 15th century...it's certainly hard to tell. Initially, it's thought that the first building on this site may have been a 12th century tower, but there are certainly no remains of this building. What can be seen today, dates from the 15th, 16th, 17th, 18th and 19th century...with each period of rebuilding and extending adding more character to the house and further masking any original features. The 15th century portion of the house, which can be seen as the central bay of the above photo, could possibly represent part of a pele tower...but could just as easily be the remaining visible parts of the original Tudor country house. Whatever the origin of this site, it's included here for it's regional importance. According to plans of the building, there are two possible parts of the existing hall that could represent these fortified beginnings. The first is the outermost room, on the right hand side of the photo shown above. This could be a 17th century tower, with the thick walls still remaining along with a newel staircase in one corner. This part of the building has been redressed and incorporated into the later hall so well, that it is now virtually indistinguishable from the newer parts of the building. The second part, is buried deep within the hall, with possibly only one thick wall remaining. These possible tower remnants are undated, and once again, indistinguishable from the later hall. The house was owned in the 1680's, by Sir Edward Hassell, Lady Anne Clifford's steward. The house has remained in the Hassell family ever since. The house is open Sunday to Thursday from March to October, and parking and entry to the gardens is free. Great views can be had from the gardens, and from the grass verges along the A592. Visit the Dalemain web site. 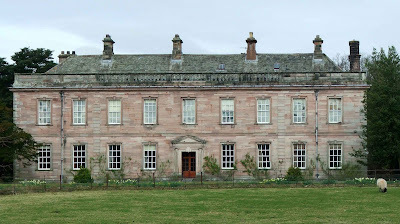 Catterlen Hall, and the remains of the Old Hall, lies less than a quarter of mile North of Newton Reigny, and less than a mile South of Catterlen. 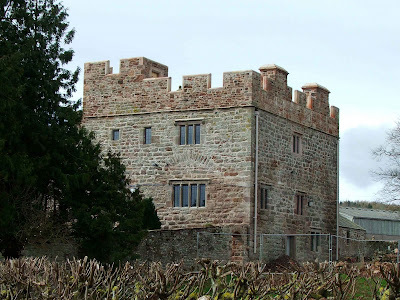 The hall consists of a pele tower built some time in the 1460's, and an Elizabethan hall, built in 1577 by Roland Vaux. The tower has walls measuring 1.2 metres thick, and retains its original crenellations. 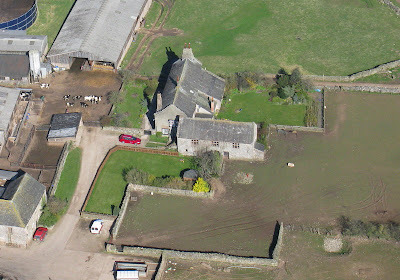 Unlike many surviving towers, Catterlen still has it's original flat roof, as can be seen on the aerial shots on the Visit Cumbria web site. 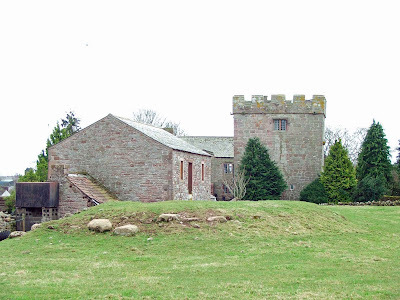 To the South East of the hall and tower, a raised platform consisting of turf, boulders and rubble, marks the spot the original Old Hall would have occupied. The mound of earth and boulders, probably represents the remains of the original 12th century tower. 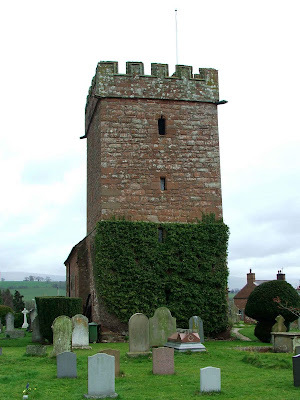 This tower, built in the 12th century, was superceded by the current hall and tower. This has to be one of the better preserved towers in the area, and is easily visible from the roadside. 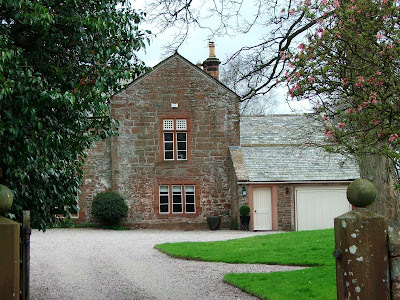 Great Salkeld is about six miles North of Penrith, on the B6412. The most prominent building in the village is the medieval church of St Cuthbert that sits in the centre of the village, occupying a large green. This is another one of those dream sites....a great medieval (and earlier) church, with a fortified portion...the late 14th century pele tower at the west end of the building. 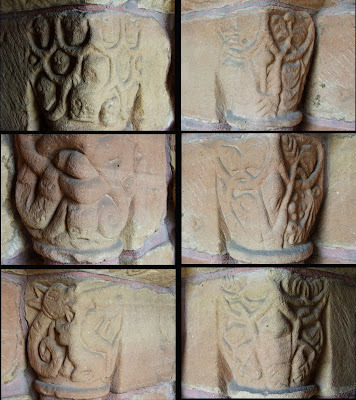 There are portions of the church that date from the 12th century, namely the North and South walls of the Nave. These walls are broken only by the insertion of much younger windows, probably from around the 1860's. 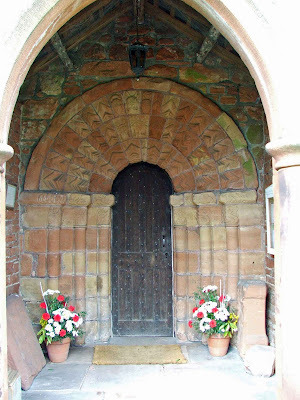 The South doorway is a fine Norman relic, with well defined dog tooth designs, still fresh and sharp. 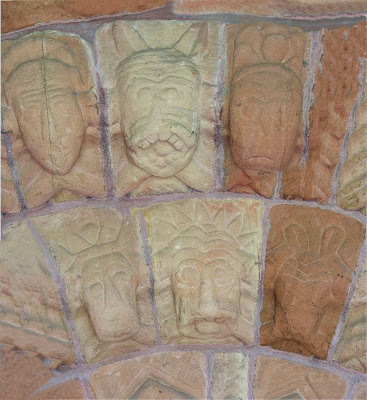 There are a multitude of beasts and figures decorating the arch, and all appear in good condition. The door must have been protected from the Cumbrian elements by a porch for many years. The chancel to the East of the church, dates from the 17th century, as do the windows here. The most intriguing portion of this church though, has to be the tower. Built in 1380 specifically as a pele tower, it would have been used as a place of safety when the English or the Scots were raiding the area. The walls are around 1.6 metres thick, over 3 storeys, including an embattled roof. The stair turret is slightly taller than the tower itself, and was unfortunately locked. Through this door, the upper floors are accessed, as is the basement, allegedly used to house prisoners. However....the tower, now used as the vestry, was unlocked so I was able to explore. The room is tiny, perhaps only 10 feet square. The three windows are tiny, probably only 8 inches wide, and two feet high....and the thickness of the walls is clearly visible. The only way into the tower, is through a narrow door up two steps. The tower has a single arched window in the internal wall, probably added at a later date. 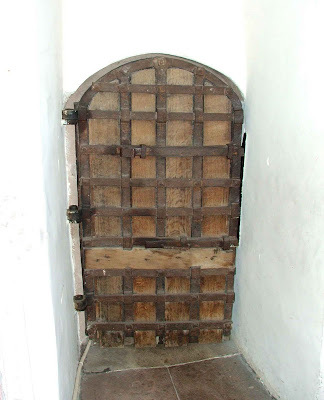 The tower was secured by a sturdy oak panelled door or a yett, with two iron draw bars that fit into a deep groove in the wall. The oak is re-enforced with iron bands that run from end to end, horizontally and vertically. It weighs heavily too, but opens very smoothly on its hinges. The roof of the ground floor of the tower is vaulted, with a very shallow arch. The door to the upper floors was unfortunately locked, but apparently there is a fireplace on the first floor with a gravestone used as a lintel above, dating from around 1290. 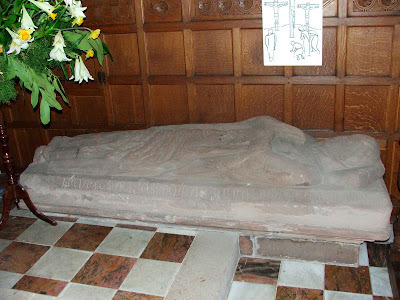 An effigy of Thomas de Caldebec, from about 1320, lays on the floor of the Chancel. 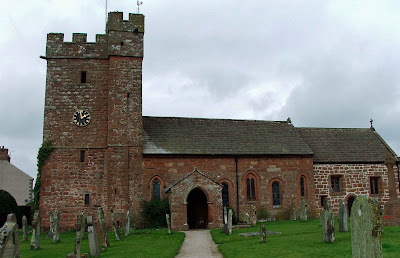 Thomas was the Rector of Great Salkeld in 1319. The church seems to be open most days, and is well worth a visit.